Some years back I decided my front borders needed a bushy, dense shrub to visually anchor each end. One that had some bright bloom in summer and needed little care. 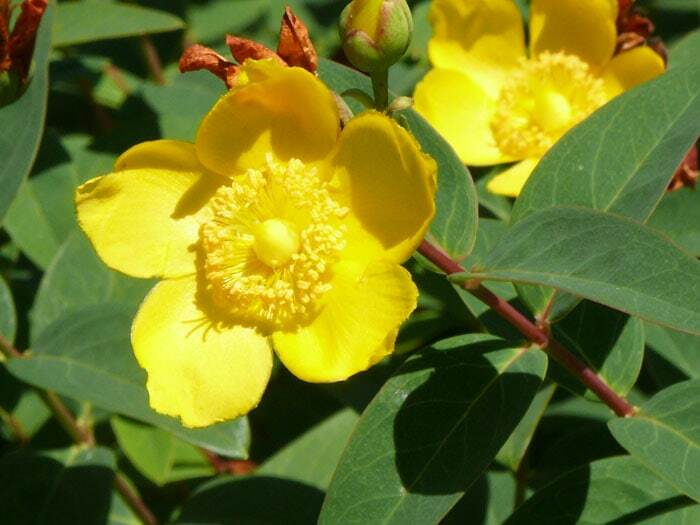 I chose Hypericum Hidcote. Hypericum Hidcote in bloom the first of June. As is most often the case in our summers, we had drought the first year the two bushes were planted. I’m not set up to water but more than likely I carried at least one five gallon buck of water to the two shrubs at some point during the drought. Growth the second year was better, but not overly impressive. And is often the case with plantings in different places, one was doing better than the other. 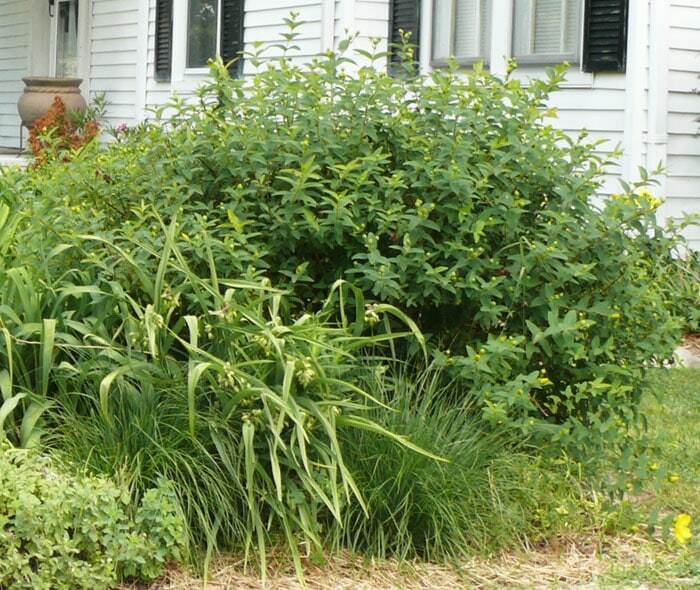 During this time while on a business trip, Bill and I stayed at a Bed and Breakfast on Maryland’s eastern shore that had several established perennial plantings and shrubs. When I asked the name of one of the shrubs (not in bloom at the time) I was surprised to find it was Hypericum Hidcote. I had not recognized it! It was huge and magnificent, although not in bloom. It was good fortune to have seen this shrub growing unrestricted in its designated spot. I mentally paired its growth habit with some forsythias I’ve seen that have been allowed to grow untouched. The planting worked well for the property of this Bed and Breakfast. It gave me the opportunity to see a way the bush could be used, but for my purposes I needed to keep mine smaller and within bounds. The good news is: it only takes a few minutes each year to keep it controlled. Basically this shrub should be pruned in late winter when the leaves are gone and dead wood is easily seen. But I do the first step in pruning when the shrub still has all its leaves in late fall. It’s much easier to see the shape of the bush this way. Then in late winter I prune out any dead wood. If the bush is too dense, up to 1/3 of the old stems can be removed. I usually cut each right to ground level, but sometimes just back to a main branch. Lastly, any winter damage that may have occurred at the tops of the stems is cut off. 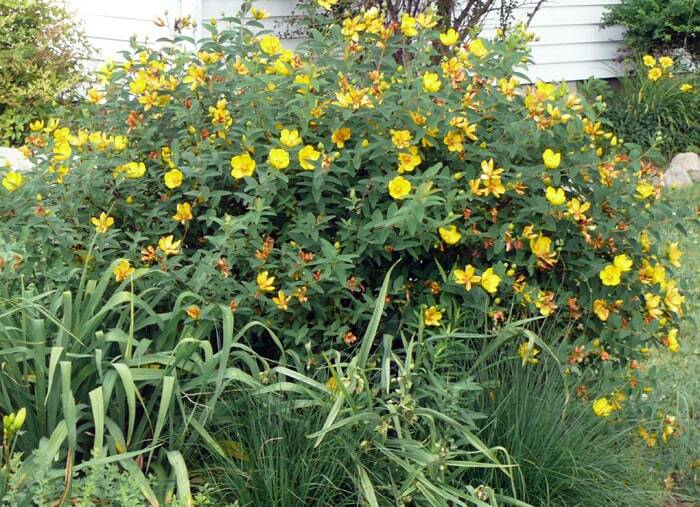 Hypericum Hidcote shrubs bloom on new growth. This pruning encourages them to develop more twiggy growth at the top of each stem. This means more of their brilliant yellow 2 inch flowers on contrasting reddish stems held above the dark green foliage in the summer. Hypericum Hidcote in May --- just before blooming. What if your bush gets totally out of shape or too big for your needs? One of mine has done just that this past summer. I plan to cut it back a foot or two from the ground and allow it to refurbish itself. With most shrubs I would stick to the rule of thumb which is to “cut back not more than 1/4 or 1/3 of the plant”. But since Hypericum Hidcote is cut back to ground level in colder zones where most of the branches are winter killed, I think it will fare just fine. If you have room in other sunny spots or in partial shade your can easily fill the openings with cuttings taken from your Hypericum Hidcote in the spring or early summer. With just a minimum of attention (or no attention – if you have room to let it grow) you should enjoy decades of beautiful bloom.